Did you ever wish you had your own personal dietitian to tell you what to eat? One who actually understood the science of nutrition and would customize her advice to fit your own personal needs and preferences? Quit dreaming; your genie in a book has materialized. The Low Carb Dietitian’s Guide to Health and Beauty will have special appeal for those who care about their health and also want to look their best. Fortunately, what works for one, works for both. Franziska Spritzler offers us a choice of three different diets: #1. A standard low-carb diet, #2. A high-fiber, moderate-saturated-fat, low-carb diet, or #3. A low-carb diet combined with intermittent fasting that allows a once a week treat meal. (Can’t face life without Haagen Daz? #3 is for you.) All three versions have a vegetarian option. She guides you though choosing which is best suited for your needs with lots of diagnostic charts and a quiz to help you decide. There are seven days of menus for each of the three diets and 40 simple, tasty recipes to get you started. The book is targeted specifically for women, but an anti-aging diet has benefits for everyone. Men don’t like wrinkles, sagging skin, or bulging bellies either! The author covers a broad range of topics and gives you the benefit of her professional opinion, but she also presents the evidence for both sides of the argument on controversial subjects. (I will be checking out some of her many references to see what I can learn and if she manages to change my mind about anything.) I especially appreciated her explanation about Net Carbs versus Total Carbs, which has recently become a hotly-debated issue in the low-carb community. Since Dr. Atkins first coined the term Net Carbs, it has been common practice to exclude fiber and sugar alcohols when figuring nutrition data, since they were thought to have little, if any, impact. She explains that insoluble fiber passes out of the body unabsorbed, but soluble fiber is fermented by colonic bacteria into short-chain fatty acids. One of these is propionate, which can be converted to glucose though a process called intestinal gluconeogenesis but, she says, it doesn’t raise the level of glucose in the blood and may actually lower it. She concludes that subtracting all fiber is the most accurate way to count carb intake, but that sugar alcohols need to be calculated separately because they vary from one to another. Sounds like a reasonable approach to me! It takes a lot of courage to do the right thing for her patients in spite of being under a great deal of pressure to conform. I urge you to support Franziska’s efforts. 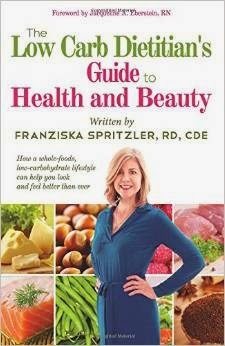 Guide to Health and Beauty, Low-carb Dietitian. Bookmark. Thanks a million for sharing this new-to-me dietician's blog site. I have many young friends with kids who'll benefit from this lady's well written articles. I've just read the one on ketogenic pregnancy. Wonderful. You are a gem to pass this on. I'm so thankful for you and others who are rescuing so many people (including me) from metabolic hell! You are welcome a million, Anonymous! Thank you for such an encouraging comment. Sounds like a very interesting book. I'll follow the link and download it to my kindle. Thanks for the info!